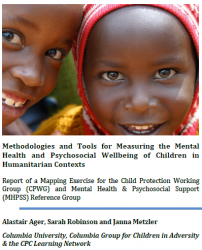 This report, conducted for the Child Protection Working Group (CPWG) and Mental Health and Psychosocial Support (MHPSS) Reference Group, maps the current repertoire of tools and approaches available for measuring children's psychosocial wellbeing. There are three major challenges with regard to measuring mental health and psychosocial wellbeing of children in humanitarian emergencies: cultural validity, reliability, and feasibility. A review of the 48 tools that met inclusion criteria led to 4 conclusions. First, there is a varied array of measures available for use in humanitarian settings. Second, measures are often not framed with respect to the comprehensive approach to MHPSS needs put forth in the IASC Guidelines. Third, the majority of measures originate in high-income countries. And last, determining age-appropriateness and the appropriateness of self- versus parental-report presents additional complexities. This represents a key step in providing practical guidance to practitioners for the development of initial assessments and ongoing monitoring and evaluation tools in humanitarian settings.